Revenue in the Comfort and Lighting segment amounts to US$5,864m in 2019. Revenue is expected to show an annual growth rate (CAGR 2019-2023) of 26.6%, resulting in a market volume of US$15,069m by 2023. Household penetration is 3.7% in 2019 and is expected to hit 10.1% by 2023. The average revenue per Smart Home in the Comfort and Lighting segment currently amounts to US$84.13. A global comparison reveals that most revenue is generated in United States (US$2,125m in 2019). The Smart Home segment Comfort and Lighting includes devices for the improvement of the living atmosphere. These are devices such as sensors and actuators (e.g. door and window sensors, shutters) as well as connected and remote controllable light sources (smart bulbs) or garage door controls. Programmable or controllable power sockets are not included (see Control and Connectivity). Integrated Smart Home: A single occupant home or households in multi-unit dwellings that are equipped with a central control unit (gateway) which is connected to the Internet and from which a large number of networked devices can be connected with one another. Integrated Smart Homes use devices from at least two market segments. In this segment integrated Smart Homes are Households with Comfort and Lighting devices and connection to other segments (e.g. smart bulbs with interaction to connected security cameras). Stand-alone Smart Home: An isolated application that does not necessarily use a central control unit, serves a single purpose and can be directly controlled (e.g. via a router) from a smart device. Included are all Smart Homes with only Comfort and Lighting devices without connection to other segments (e.g. only smart bulbs). Reading Support Revenue in the Comfort and Lighting segment amounts to US$5,864m in 2019. Reading Support The Comfort and Lighting segment is expected to show a revenue growth of 34.2% in 2020. The “Revenue” box shows the forecasted revenue development of the selected market (market segment, region) for each year. The “Revenue Growth” box shows the year-over-year revenue development of the selected market (market segment, region) in percentage terms. Reading Support In the Comfort and Lighting segment, the number of active households is expected to amount to 194.9m by 2023. 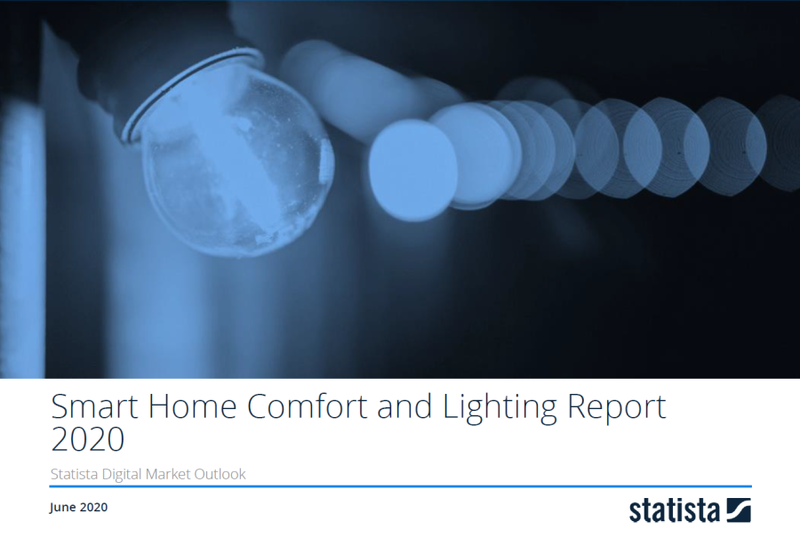 Reading Support Household penetration in the Comfort and Lighting segment is at 3.7% in 2019. The "Smart Homes" box shows the number of existing Smart Homes (single occupant homes and households in multi-unit dwellings) of the selected market (market segment, region) in millions for each year. The "Penetration Rate" box shows the share of Smart Homes from the total number of private households of the selected market (market segment, region) for each year. Reading Support The average revenue per active household in the Comfort and Lighting segment amounts to US$84.13 in 2019. The box shows the average annual revenue per Smart Home (single occupant homes and households in multi-unit dwellings) in US dollars of the selected market (market segment, region) for each year. Reading Support In the year 2017 a share of 39.6% of users is 25-34 years old. Reading Support In the year 2017 a share of 62.8% of users is male. Reading Support In the year 2017 a share of 49.8% of users is in the high income group. The Users by age box shows the age distribution of users of the selected market (market segment, region) in age groups. The data is based on Statista's Global Consumer Survey. The Users by gender box shows the gender distribution of users of the selected market (market segment, region). The data is based on Statista's Global Consumer Survey. Data in countries not covered by the Global Consumer Survey refer to the superordinate world region. The Users by income box shows the income distribution of users of the selected market (market segment, region) in tertiles. The data is based on Statista's Global Consumer Survey. Values shown are only based on survey respondents who answered the question regarding their income. Reading Support With a market volume of US$2,125m in 2019, most revenue is generated in United States. Reading Support With a rate of 17.4%, the household penetration in the Comfort and Lighting segment is highest in United States. The “Revenue” tab shows a comparison of revenues for the leading economies in the selected market (market segment, region) and year. The "Household Penetration" tab shows a comparison of household penetration rates for 50 of the world’s leading digital economies in the selected market (market segment, region) and year. The following Key Market Indicators give an overview of the demographic, economic and technological development of the selected region on the basis of general KPIs. The calculation of Statista’s Market Outlook is based on a complex market-driver logic including over 400 region-specific data sets. Here you can find more studies and statistics about "Comfort and Lighting". Full access to the Expert Tools are exclusively available with the Corporate Account.